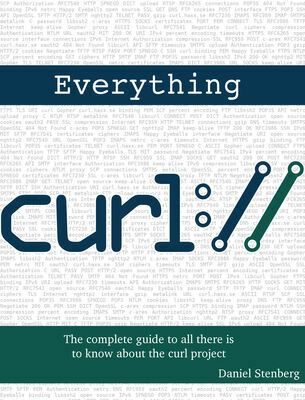 Everything curl is an extensive, detailed and totally free book, available in multiple formats. Learn how to use curl. How to use libcurl. How to build them from source or perhaps how the curl project accepts contributions. There's something for everyone in this, from the casual first-time users to the experienced libcurl hackers. Everything curl is written by Daniel Stenberg but is also itself an open project that accepts your contributions and help. You can buy the 2018 Edition, 250-page printed paperback version of the book from Alibris UK. The price is about 20 Euros plus shipping within Europe, slightly more outside; see the site for exact details.